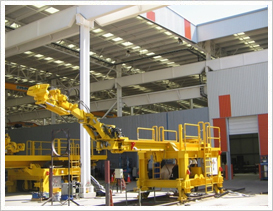 For the first time in its history, Revesol arrives to Zambia with the selling of a Mill Liner Handler machine system. The project where the machine was sold belongs to the development of a copper mine. Revesol made the business with the biggest Chinese SAG and Ball Mill company of the world, which it has an important international presence. “For Revesol this was a very interesting negotiation because of the different types of languages and nationalities that were involved. But the most important thing that makes Revesol proud is that they put a machine in the African continent, and with this they can say that in every continent where mining is relevant Revesol has equipment in function. You can find Revesol equipment in America, Asia, Oceania, and now, successfully in Africa” they say in the company.